Welcome back to the second (and final) part of our Beat Em Up game tutorial series! If you followed the first part, then you’ve already created the hero and have the D-pad controller present in the game. You will pick up where you left off, and by the end will have completed your very own Beat Em Up game. This part is exciting, in that you will see the results of much of what you do on the screen. Just to mention a few items: you will add movement, scrolling, collision, enemies, AI, and some polish with music and sound effects! Before you start, make sure that you have a copy of the project from Part 1, either by going through the first tutorial, or by downloading the finished project. Don’t forget to grab a copy of the resource kit if you haven’t already, as it contains some stuff that you haven’t used yet. In the last section of Part 1, you created a D-pad controller and displayed it onscreen. But at the moment, pressing the D-pad crashes the game instead of moving the player. Let’s remedy this quickly! The first step is to create a movement state for the hero. This should be familiar to you by now. You add new frames for the walking animation, and create the walk action in a similar way to how you created the idle action. 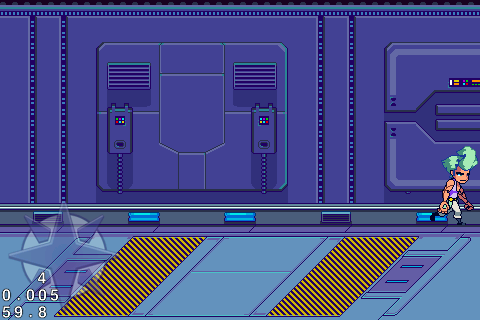 This checks to see if the previous action was idle, then it changes the action to walk, and runs the walk animation, but if the previous action was already a walk action, then it simply changes the velocity of the sprite based on the walkSpeed value. The method also checks the left/right direction of the sprite, and flips the sprite accordingly by switching the value of scaleX between -1 and 1. To connect the hero's walk action to the D-pad, you must turn to the delegate of the D-pad: GameLayer. You trigger the hero's move method every time the SimpleDPad sends a direction, and trigger the hero's idle method every time the touch on SimpleDPad stops. Build and run, and try moving the hero using the D-pad. All right, he's walking! Wait a minute... he's not actually moving... what gives? Take a look walkWithDirection: again, and you'll notice that it doesn't do anything except change the velocity of the hero. Where is the code for changing the hero's position? Changing the hero's position is the responsibility of both ActionSprite and GameLayer. An ActionSprite never really knows where it is located on the map. Hence, it doesn't know when it has reached the map's edges. It only knows where it wants to go – the desired position. It is GameLayer's responsibility to translate that desired position into an actual position. You already declared a CGPoint named desiredPosition for ActionSprite. This is the only position value that ActionSprite should be working with. This method is called every time the game updates the scene, and it updates the desired position of the sprite only when it is in the walking state. It adds the value of velocity to the current position of the sprite, but before that, velocity is multiplied by delta time so that the time interval is factored into the equation. Multiplying by delta time makes the hero move at the same rate, no matter the current frame rate. Position + Velocity * Delta Time really just means move x and y (velocity) points each second (1 dt). Note: This way of integrating position is called Euler's integration. It's known for being an approach that’s easy to understand and implement, but not one that is extremely accurate. But since this isn't a physics simulation, Euler’s integration is close enough for your purposes. You schedule GameLayer's update method, which acts as the main run loop for the game. 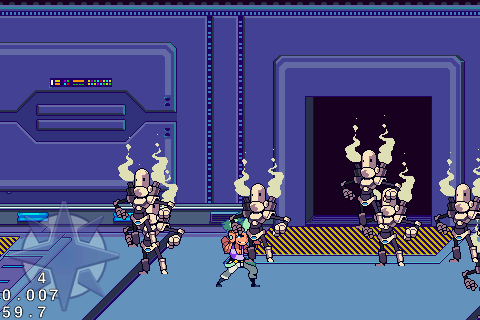 Here you will see how GameLayer and ActionSprite cooperate in setting ActionSprite's position. mapSize: this is the number of tiles in the Tiled Map. There are 10x100 tiles total, but only 3x100 for the floor. tileSize: this contains the dimensions of each tile, 32x32 pixels in this particular case. 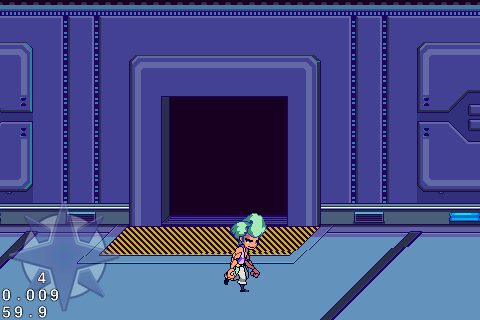 If the position of ActionSprite is within the boundaries that have been set, GameLayer gives the hero its desired position. If not, GameLayer asks the hero to stay in its current position. Note: The MIN function compares two values, and returns the lower value, while the MAX function returns the higher of two values. Using these two in conjunction clamps a value to a minimum and maximum number. Cocos2D also comes with a convenience function for CGPoints that is similar to what you just did: ccpClamp. Build and run, and you should now be able to move your hero across the map. You'll soon find, though, that there's one more issue that needs attention. The hero can walk past the right edge of the map, such that he vanishes from the screen. You can set the tiled map to scroll based on the hero's position by plugging in the method found in the tile-based game tutorial. This code centers the screen on the hero's position, except in cases where the hero is at the edge of the map. For a complete explanation of how this works, please refer to the previously mentioned tile-based game tutorial. Build and run. The hero should now be visible at all times. You already have a base model for the sprite: ActionSprite. You can reuse that to make computer-controlled characters for the game. This part of the tutorial will move rather quickly, since it's very similar to how the hero was created. Hit Command-N and create a new file with the iOS\Cocos2D v2.x\CCNode Class template. Make it a subclass of ActionSprite and name it Robot. As with the hero, the above code creates a robot with three actions: idle, attack and walk. It also fills in the two measurement values: centerToBottom and centerToSides. Let's jump straight to filling the game with a lot of these robots. You want a brawl, don’t you? Created an array of 50 robots, and added them to the batch node. Used the random functions you created in Defines.h to randomly place the 50 robots across the tile map's floors. You also made sure that no robots are placed at the starting point by making the minimum random value bigger than the screen's width. Made each robot perform its idle action. Build and run, and walk the hero around until you see robots on the map. Try walking around a bit in an area with robots, and you'll notice that there's something really wrong with how the robots are drawn. According to the current perspective, if the hero is below a robot, then he should be drawn in front of the robot, not the other way around. For things to be drawn in the right sequence, you need to explicitly tell the game which objects to draw first. You should already know how to do this – think back to how you made the tile map appear behind everything else. Figured it out? If your answer was z-order/z-value, then you're 100% correct! 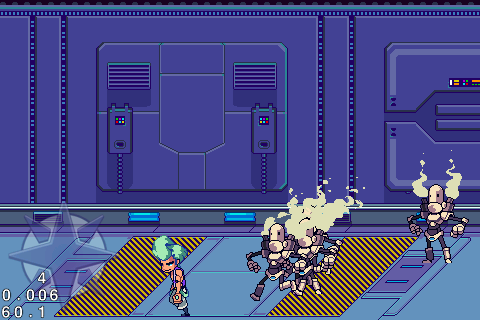 The SpriteBatchNode and the CCTMXTiledMap were both added as direct children of GameLayer, while the hero and the robots were added as children of the CCSpriteBatchNode. 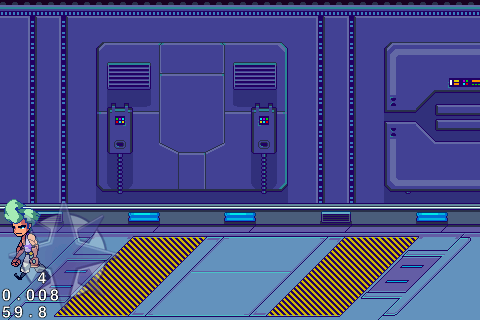 GameLayer is responsible for drawing the CCSpriteBatchNode and CCTMXTiledMap in the proper sequence, while it is the CCSpriteBatchNode's responsibility to draw the hero and the robots in the correct sequence within itself. You didn't explicitly assign a z-value to the hero and the robots. By default, the object added last will have a higher z-value than the previous objects – and that's why all the robots are drawn in front of the hero. To fix the broken drawing sequence, you need to handle the z-order dynamically. Every time a sprite moves across the screen vertically, its z-order should be changed. The higher a sprite is on the screen, the lower its z-value should be. Every time the sprite positions are updated, this method makes the CCSpriteBatchNode reorder the z-value of each of its children, based on how far the child is from the bottom of the map. As the child goes higher, the resulting z-value goes down. Note: Each CCNode has its own property named zOrder, but changing this won't give you the same effect as calling reorderChild from the parent. It's the parent's responsibility to draw its children in order, so it should also be the parent's responsibility to set the order of its children. Build and run, and the drawing sequence should now be correct. Well, your hero's now got company. But there's still nothing much for him to do. And if this is a Beat Em Up game, then he should be able to beat somebody up, right? Time to lay down the hurt on these robots! Hit box: this will represent the body of the sprite. Attack box: this will represent the hand of the sprite. 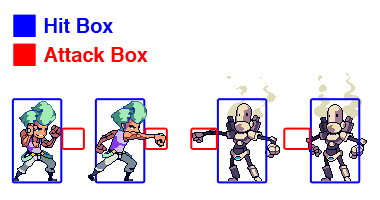 If the attack box of one ActionSprite collides with the hit box of another, then a collision occurs. This distinction between the two rectangles will help you decide who hit whom. Each bounding box has two rectangles: the actual, and the original. The original rectangle is the rectangle local to each individual sprite, and never changes once it is set. Think of it as the internal location of the bounding box as the sprite sees it. The actual rectangle, on the other hand, is the rectangle as it is located in world space. As the sprite moves, so does the actual rectangle. Think of it as the location of the bounding box as the GameLayer sees it. The above creates two bounding boxes for ActionSprite: the hit box, and the attack box, as discussed above. It also sets up a factory method for a bounding box, which simply creates a BoundingBox structure given an origin and size. The first method creates a new BoundingBox and is there to assist subclasses of ActionSprite in creating their own bounding boxes. The second method, transformBoxes, updates the origin and size of the actual measurements of each bounding box, based on the sprite's position and scale, and the local origin and size of the bounding box. You take the scale into consideration because it determines the direction the sprite is facing. A box located on the right side of the sprite will flip to the left side when the scale is set to -1. Whenever an attack box (red) intersects with a hit box (blue), a collision occurs. Before writing the code that checks for this intersection of bounding boxes, you must first make sure that ActionSprite can react properly to being hit. You've already coded the idle, attack, and walk actions, but still haven't created the hurt and death actions. As long as the sprite is not dead, getting hit will switch its state to hurt, execute the hurt animation, and subtract the right amount of damage from the sprite's hit points. If the hit points fall below 0, then the knocked out (death) action occurs. 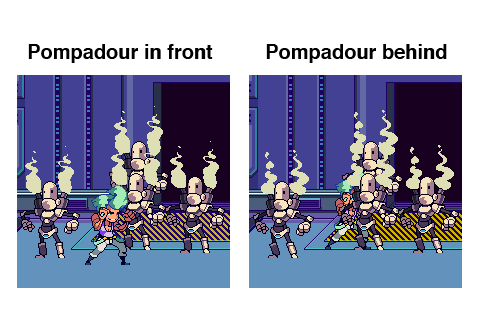 To complete these two actions, you still have to retrofit both the Hero and Robot classes with their respective hurt and death actions. Check if the hero's state is attack, and if the robot's state is anything but knocked out. Check if the hero's position and the robot's position are only 10 points apart vertically. This indicates that they are standing on the same plane. Check if the attack box of the hero intersects with the hit box of the robot by using the CGRectIntersectsRect function. If all of these conditions are passed, then a collision occurs, and the robot's hurt action is executed. The hero's damage value is passed in as a parameter, so that the method knows just how many hit points it has to subtract. Build and run, and get punching! You're punching, punching and they all fall down! But they never attack back? What fun is that? Completing the game should require both a winning and losing condition. Currently, you can kill all the robots on the map, and nothing will happen. 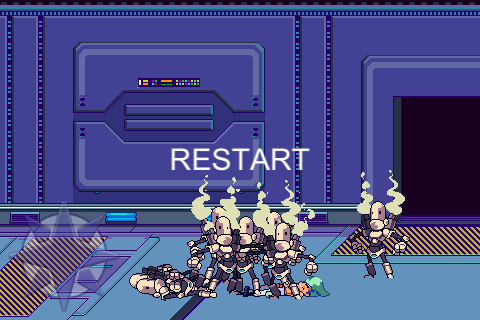 You want the game to end when either all the robots are wiped out, or the hero dies. You certainly won't have the hero dying if the robots just stand around acting like punching bags. :] To make them move and use the actions that you created for them, you need to develop a simple AI (Artificial Intelligence) system. The AI that you will create is based on decisions. You will give each robot a chance to decide on a course of action at specific time intervals. The first thing that they need to know is when they get make this choice. This property is named to indicate its purpose – it holds the next time at which the robot can make a decision. Now that is one long snippet of code! Don't worry, soon it will all be clear. You keep a count of how many robots are still alive. A robot is considered alive as long as its state is not knocked out (dead). This will be used later on to determine whether or not the game should end. You check if the current application time went past the robot's next decision time. If it did, then it means that the robot needs to make a new decision. CURTIME is a shortcut macro you defined in Defines.h. You check if the robot is close enough to the hero so that its punches have a chance to connect with the hero. If so, then the robot makes a random choice of whether to face the hero and punch, or to remain idle. If the robot decides to attack, you check for collisions in the same way you did before for the hero's attack. This time, the roles of the hero and the robot are reversed. If the distance between the robot and the hero is less than the width of the screen, then the robot gets to decide to either move towards the hero, or remain idle. The robot moves based on the normal vector produced by both the hero's position, and the robot's position. The normal vector is like the distance between the two, but with the value clamped from -1.0 to 1.0. Or rather, it is the x-y coordinate version of the angle between the hero and the robot. Every time a robot makes a decision, its next decision time is set to a random time in the future. In the meantime, he continues executing whatever actions he started running in the last decision time. Here, you make sure that the Robot AI method you created earlier is called every game loop. It also loops through each robot and moves them based on their desired position. Build and run, and face the robotic menace from down the corridor! Play the game until you beat all the robots, or until the hero dies, and you’ll see that the game gets stuck. If you followed my previous tutorial on making a game like Fruit Ninja, you probably know that I like to end tutorial games by simply showing a button that allows you to restart everything. So let's do that here as well! The first method creates and shows a Restart button that, when pressed, triggers the second method. The latter just commands the director to replace the current scene with a new instance of GameScene. Both of these if statements check for game-ending conditions. The first one checks if the hero is still alive right after having been hit by a robot. If he's dead, then the game ends. The second one checks if all the robots are dead. If they are, then the game also ends. There's one funky check happening here, where the HudLayer looks to see if it has a child with a tag value of 5. And you might be wondering – what is that all about? Look back at endGame above, and you will see that the End Game menu has a tag value of 5. Since this checker runs in a loop, it needs to make sure that the End Game menu has not previously been created. Otherwise, it will keep on creating new End Game menu items every chance it gets. Build and run. Have fun beating up those pesky robots! The game plays pretty nicely, but it isn't very satisfying when you sock it to a robot without audio feedback. And some background music might not hurt either. I can assure you, I’m not going to leave you hanging without some fun music and sound effects! For this game, you'll be using background music made by Kevin MacLeod of Incompetech, and also some 8-bit sound effects that I created using the neat bfxr utility. Drag the Sounds folder from the resource kit (the one you downloaded and extracted in Part 1 of this tutorial) into the Resources group of your project. 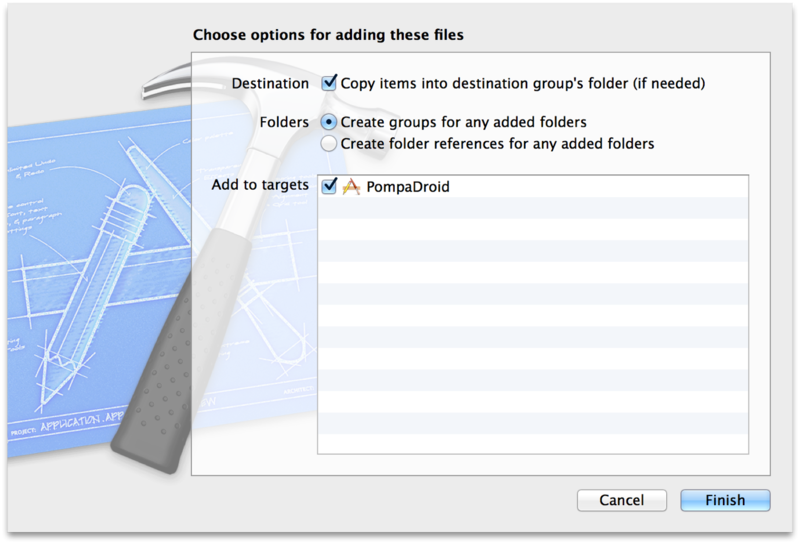 Make sure that Copy items into destination group's folder is checked, and that Create groups for any added folders is selected. The above code preloads the music and sound effects in GameLayer, and plugs in the appropriate sound effect for each action event. You're done! Build, run, and play until you drop! Here is the final project with all the code from the complete tutorial. You may have been through both parts of this tutorial and have the bodies hitting the floor, but you’ve only seen the tip of the iceberg! There is still a lot more ground to be covered when it comes to making a full-fledged Beat Em Up Game. 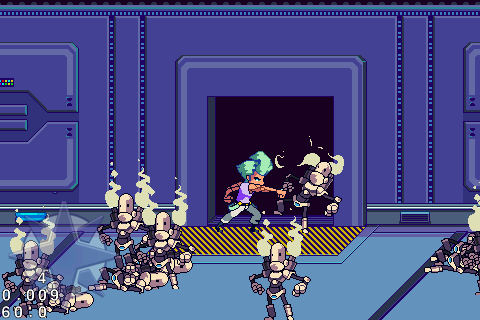 If you're craving more Beat Em Up action, I have good news for you - I will soon be releasing a Beat Em Up Starter Kit here at raywenderlich.com! State machine applied to game events, and battle events with enemy spawning! Update 4/8/13: Good news - the Beat Em Up Game Starter Kit is now available! Check it out on the raywenderlich.com store.